With recent funding from Preserve America, the City of Covington introduced the Experience Covington Tour series which can also be found at the main branch of the Kenton County Library at the corner of 5th and Scott Street (map). This free tour series is self-guided but there are many resources at your fingertips to make it enjoyable. While you can do most of your homework on the website, the library also offers a kiosk to help you plan your outing. The kiosk is a bit hard to find in the library, so when you go make sure you check in with someone so that you can easily find it or just do your homework at home as the kiosk is simply the website made available in the library. Cathedral Basilica of the Assumption [TOP] by City of Covington; UFO House [LEFT] by Joe Orman; and Roebling Suspension Bridge [RIGHT] by Derek Jensen. In all there are six tours that you can take in and around the Covington area, and while there is some overlap there are a total of 48 different stops that are discussed on the Playaway audio devices that you can pick up at the library. The device is easy to operate and you can either follow the tours as directed or make up your own as you go along. Additionally driving directions are available from the web or the kiosk to make sure you don’t get lost as you Experience Covington. So what will you see on tours of Covington? Well, it depends on which tour of the six you choose. 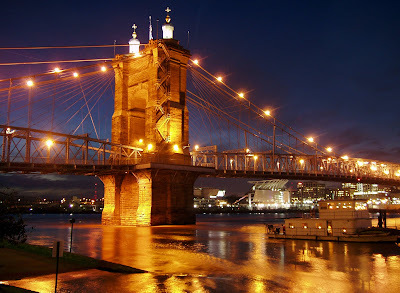 Not surprisingly, there is a Historic Tour which has stop including the Roebling Suspension Bridge and the accompanying murals as well as the Riverwalk Statues and the Duveneck Arts & Cultural Center among many other stops. 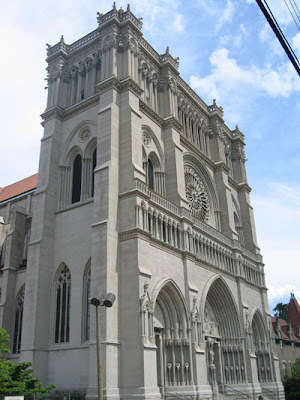 More surprising, and dare I say unexpected, is the Unexpected Covington Tour. Think you know Covington? 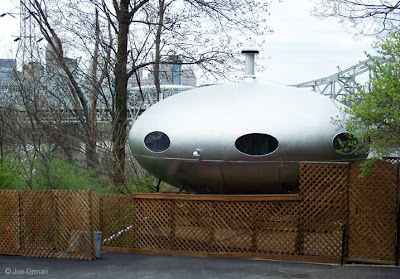 Well, this tour stops at places such as the Spaceship House, Glier’s Goetta, and the Baker Hunt Art & Cultural Center among others. Stops along this tour (and all the tours for that matter) will definitely teach folks about some of the gems around Covington regardless of how familiar they are with one of Cincinnati’s southern neighbors. Now for the really good news: this whole thing is free and open to everyone, not just members of the Kenton County Library! Check out the audio for a 3 day period and work your way through whatever tours you feel like you’d enjoy. The audio selections are located near the kiosk, so make sure to ask where it is when you go and the good folks that work there will point you in the right direction. The library will provide headphones, or you can plug the Playaway device into the A/V jack in your car which definitely makes the time even more enjoyable.